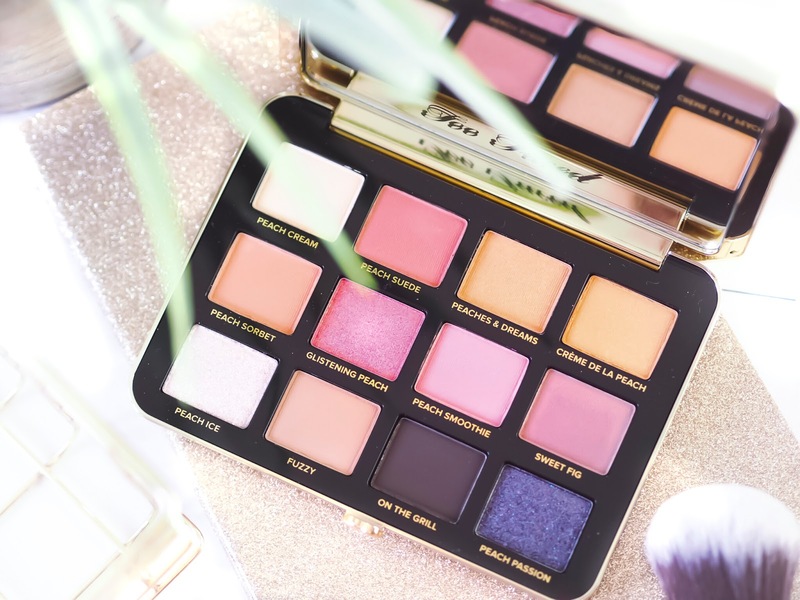 I spend a lot of time talking about Too Faced – they’re one of my all time favourite brands and I have been head over heels with their Peach ranges over the last year. First there was the Sweet Peach collection, then came Peaches and Cream, which if I’m totally honest, blew my mind. It exceeded all my expectations and became not just one of my favourite ever Too Faced ranges, but one of my all time favourite ranges, ever. There’s something that gets me about a whole themed collection, and Too Faced don’t do things by half, so when I saw it, I loved it and now have pretty much the entire range in my TF Collection. 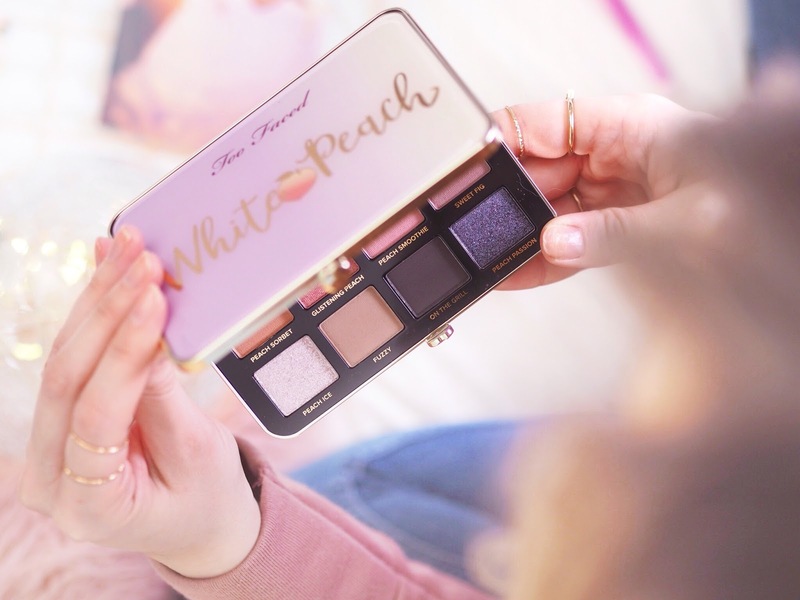 The latest product to add to my Peaches and Cream hoard, was the stunning White Peach eyeshadow palette. I got this in the Too Faced store in Carnaby Street a few weeks ago, along with some other bits and pieces. Because, who can go in there and only pick up one thing?! So, the White Peach palette retails for £33 and features 12 shades inside the compact. There’s a mirror in the lid and the compact itself has a really cute and retro, almost evening-bag, style to it. It’s cute that’s for sure! The shadows are infused with peach and sweet fig cream so when you open it for the first time, the smell really hits you – it’s sweet and delicate and just utterly lovely. The finishes of the shadows range from matte, shimmer/satin and glittery so you’ve got a great range across the palette. Which means you can create a whole load of different styles with just this palette. I find White Peach to be such a versatile palette because of this – it’s got you covered for everyday looks as well as evening wear. The shades Peach Suede and Peach Sorbet are great for the crease and transition shade and there’s the always needed Peach Cream which is the pale cream tone for the brow bone too. Then you’ve got On The Grill and Peach Passion for a great sultry and smokey crease to glam things up and a pop of Peach Ice over any of the shades will instantly add the most insane and pigmented icy glitter! Speaking of pigmentation, Too Faced are always excellent for this. But I found that the matte’s in this palette were exceptional. 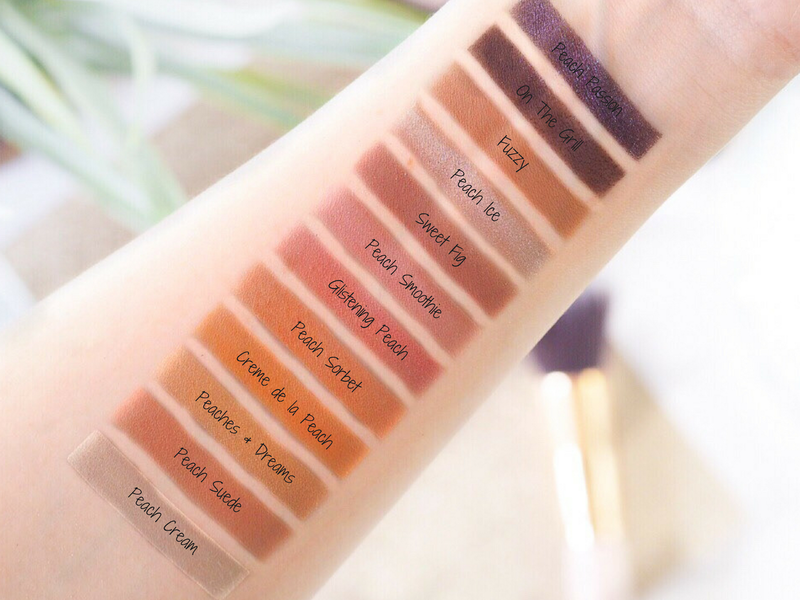 Everyone knows that shimmers and satin finishes tend to have a better pigmentation and payoff than a matte, but the mattes in this were just as creamy to apply. This meant there was a good colour payoff after just a single stroke each time. I was seriously impressed at how close the pigmentation between the mattes and shimmers measured up. I also found that the fallout was very limited, showing just how creamy the shadows actually are. My pet peeve with palettes is the sheer amount of fallout you can sometimes get, but this palette barely has any. So it gets huge thumbs up from me there too! A really versatile palette that’s got the perfect champagne and plum tones for everyday, this is an essential for make-up collections! Get it from Too Faced.